Ayanna Reese walked away from a life of full time missions to become Regent’s first collegiate coach. This exclusive interview dives into the life of a decorated track star from Manhattan. Coach Reese started her running career at 12 years old and never looked back. Coming out of George Washington High School, Reese was the number three recruit in the country and a part of a national champion relay team. Ohio State University, UNLV, and the University of Tennessee all wanted Reese to run for them. While Reese was a star athlete, there were other challenges that she faced on her road to a collegiate career. Her last two choices boiled down to the University of Ohio and the University of Tennessee. As Reese was planning to call Ohio State University and reject their offer, her discerning mother told her to accept Tennessee’s offer first. Tennessee, Reese’s first choice, had unfortunately rescinded their original offer of a full scholarship. At this time, Reese thought of her former club coach’s wise words, “You can go to a division three school and be a star, or you can go to a division one school and have to work at it. Build your success.” Reese decided to take a full scholarship to the University of Ohio and build her success. This was not only the start of Reese’s successful track career, but it was the beginning of her road to becoming Regent University’s first ever collegiate coach. What was the process of becoming Regent’s track coach? 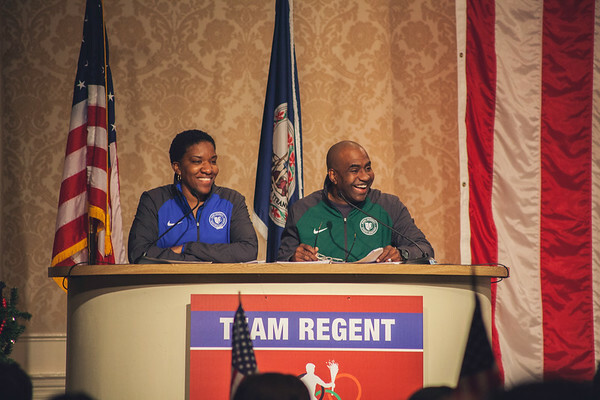 For the first time since being offered the position, Ayanna began to seriously consider the possibility of building the track program at Regent. After the meeting, Reese contacted key mentors throughout her life. Reese’s collegiate track coach, which she had remained close with throughout the years, told her that she was a perfect candidate for the job. Reese had come to the conclusion that God’s hands were all over this opportunity. What are some of the toughest challenges as a coach? There are a lot of unknowns when becoming the first ever coach at a university. Not only is coach Reese managing a diverse group of runners, but she has to face the pressure of building a program from the ground up. While these challenges are tough on coach Reese, she is confident in her abilities, the team, and God’s overarching plan for her life. Career networking event for communication students! April 3, 2017 Philip Reynolds Comments Off on Career networking event for communication students!